Dear Friends, SBI has finally released the SBI Clerk posts notification of Junior Associates (Customer Support & Sale). Applicants has required to visit to the official career page of SBI to fill in the online application forms as the entire process to apply for SBI Clerk will be online. SBI conducts various exam for the posts lying vacant with their branches all over the India. Every year,there are more than 20,000 posts notified in the category of Probationary Officers (PO) and Clerical level posts. SBI PO and Clerical level posts are advertised every year in the month of Apr/May. Every Graduated person are expecting a huge number of SBI Clerk vacancies in the month of April/May 2019 for SBI Clerk 2019 Exam Schedule. Candidates from all over India apply for these posts. Only graduates can apply for this post of SBI Clerk 2019. Those who are planning to appear in the upcoming SBI Clerk 2019 exam can find complete details below with the further details regarding the Clerk Examination conducted by SBI. The official notification of SBI Clerk is out. The Online registration for SBI Clerk is from 12th April 2019 to 3rd May 2019. Pre-Exam will be held on June and July tentatively and computer based. Main Exam will be be held on 12 Aug 2019. 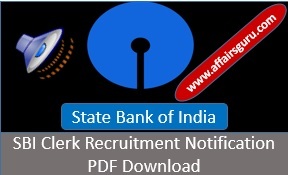 Click here to Download Official Notification of SBI Clerk Notification – will be update soon. Every year more than 25 lakh aspirants give the for SBI Clerk. Number of Vacancies is 8900+ this year. Below is the regular vacancy. Aspirants must check own eligibility criteria before applying for the posts. All the eligibility criteria facts are given below. Graduation degree in any of the streams such as BA, B.Com, BSc, B.Tech, etc., from a University recognized by the Government of India.Candidate who possesses same qualification from the university recognized by the Central Government is also eligible to apply for this exam. Certificate which supports that they are graduates on the day they were registered for the exam.The percentage of marks obtained in Graduation should be mentioned at time of registration for the SBI Bank-Clerk examination. Knowledge of computer operation is a must as SBI Clerk exam is conducted online. Candidates should have verbal and written proficiency in official language of the State/UT. The candidate should be able to read, write and speak the language. Not below 20 years and not above 28 years. Click on the given above direct link to apply. Press the button ‘Click here for New Registration’ available on the page. Fill your name, email and contacts on the registration page. You will get the Registration Number and Password on email and phone number for future use. Upload your passport sized photo and signature. Fill all required your details and qualification , experience if there is. Preview your application before Submission. No change will be allowed after submit. Do the Payment through Debit or Credit Card. You can also do payment by online banking. You can visit nearest SBI branch for application payment. Keep the hard copy of your application for future use. The category wise application fees for SBI Clerk exam is given below. Fee/Intimation charges once paid will NOT be refunded on any account nor can it be held in reserve for any other examination or selection. The application fee must be paid online itself. To know more please check the complete guide for SBI Clerk Application. The latest revision of Bank Clerk salary as per 10th Bipartite settlement, took place on Nov 2012; nonetheless the final agreement was signed in May 2015. Here Rs. 20950 is the revised basic pay of Bank clerk as applicable on 1st January 2016. Thus the new entrant in a Bank as Clerk is liable to get Rs. 20,950 as basic pay. SBI is the only authority to add or remove an exam centre. The candidates can’t make any request for the change of the exam centre. Any indecent behavior at the examination centre can lead to cancellation of the application. Aspirants who fill the SBI Clerk application form after fulfilling the eligibility criteria prescribed by the bank will appear for the first stage of SBI Clerk selection procedure i.e. preliminary exam. The exam is objective and has 100 multiple choice questions divided in three sections, English Language, Reasoning Ability and Numerical ability. Candidates will be 60 minutes to complete the exam. The sectional cutoff for the preliminary exam of SBI Clerk is decided by the bank and candidates have to secure qualifying marks in each section. Candidates 20 times the number of vacancies will be shortlisted by the bank to appear in the mains examination. Candidates qualifying the preliminary exam will be eligible to appear for the second stages of SBI Clerk selection procedure i.e. mains examination. The mains exam is held online and consists of 190 multiple choice questions. The paper has a total of 4 sections, General/Financial Awareness, English Language, Quantitative Aptitude and Reasoning Ability and Computer Aptitude. Candidates will have 2 hours 40 minutes to complete whereas each section has sectional timings. The structure of SBI Clerk 2019 main examination is, for general/financial awareness, the number of questions and marks will be 50 and the time duration will be 35 minutes. For the English language, the number of questions and marks will be 40 and the duration will be 35 minutes. For quantitative aptitude, the number of marks and questions will be 50 and the time duration will be 45 minutes. The number of questions and marks for reasoning ability and computer aptitude is 50 and 60 and the time duration is 45 minutes. The total marks for the exam is 200 and 1/4th marks allotted to a question will be deducted as negative marking for incorrect answer. According to the selection procedure of SBI Clerk 2019, questions in both preliminary and mains exam will be bilingual, i.e. set in English and Hindi except for General English and English language sections. Same as preliminary exam, candidates will have to secure marks according to the sectional cutoff in SBI Clerk 2019 mains exam. Candidates in addition to the prelims and mains exam will have to produce 10th standard mark sheet/certificate showing that they have studied official (local) language. Such candidates will not be subjected to a language test. Those candidates who are unable to produce a certificate will have to qualify a language test will be conducted before final selection. SBI will prepare a final merit of all the qualified candidates. Marks secured by the candidates in the preliminary exam will not be counted as it is qualifying in nature and the merit list will be based on candidate’s scores in the mains exam. Candidates who stands sufficiently high in the merit will be provided an appointment. The provisional allotment of the eligible candidate is released on the official website. The SBI allots Banks to the candidates on the basis of the preferences they have made at the time of the online registration. SBI plays its role in the selection process till the provisional selection to different banks. Further the responsibility to inform the qualified candidates about their joining dates and procedure lies with the respective banks. Prelim Exam will be online computer based. Each section has 20 minutes duration i.e. total time will be allocated 60 minutes. Mains Exam will also be online computer based. Total time will be allocated 2 hours 40 minutes. The candidates must attempt the sections in the same order and within the allotted time fixed by the examining body. The candidate can’t leave the existing section before the time allotted. The next section can only be attempted after the current section is completed. There is a negative marking with a deduction of 0.25 marks for every mistake. Aspirants can also take the training based on the category from some training centre. Check all details by clicking on below link. AffairsGuru Team will soon released the SBI Clerk cut off after examination. SBI will have some additional centres or remove some depending on requirement. The Candidates wha opt for pre-examination training should download their call letter for training by entering their registration number and password/ date of birth from Bank’s website. Pre-Exam training call letter will not be sent by post.